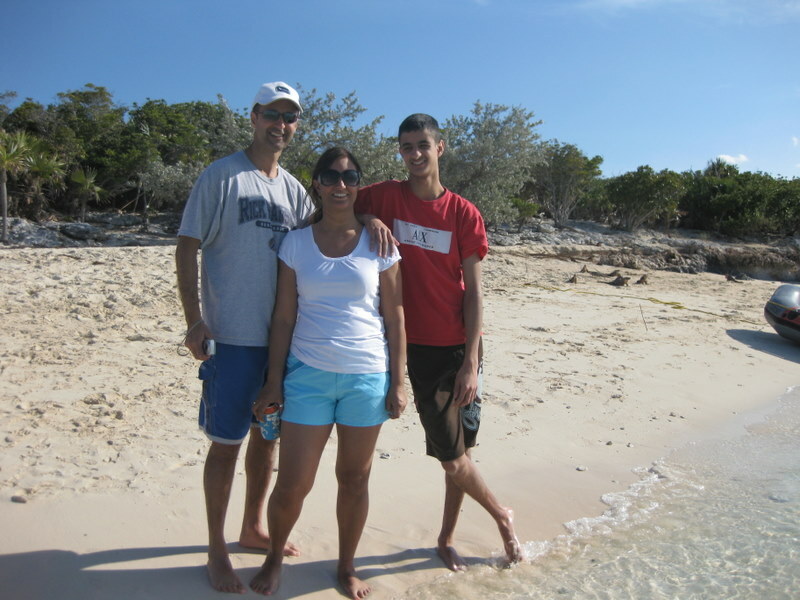 After enjoying Norman’s Cay for 3 days, albeit without water… we made our way back to Nassau. 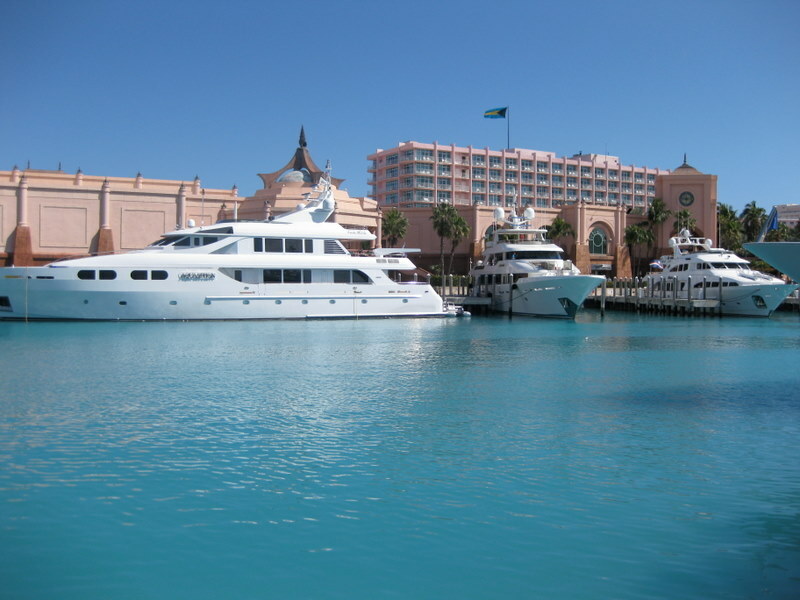 We had heard about Atlantis – the marine resort on Paradise Island. It is hideously expensive to moor there and they don’t allow boats UNDER 40 feet – we guess they don’t want riff-raff in the neighbourhood. So we suddenly became 40 feet and made a reservation. It is hard to believe how “over-the-top” the boats are. They are massive, all require a captain and crew (uniformed), outlandishly decorated and they have every gadget and piece of equipment imaginable. It costs $100 per person per day to enjoy the attraction if you walk in but this is waived for hotel and marina guests… what a deal!!! 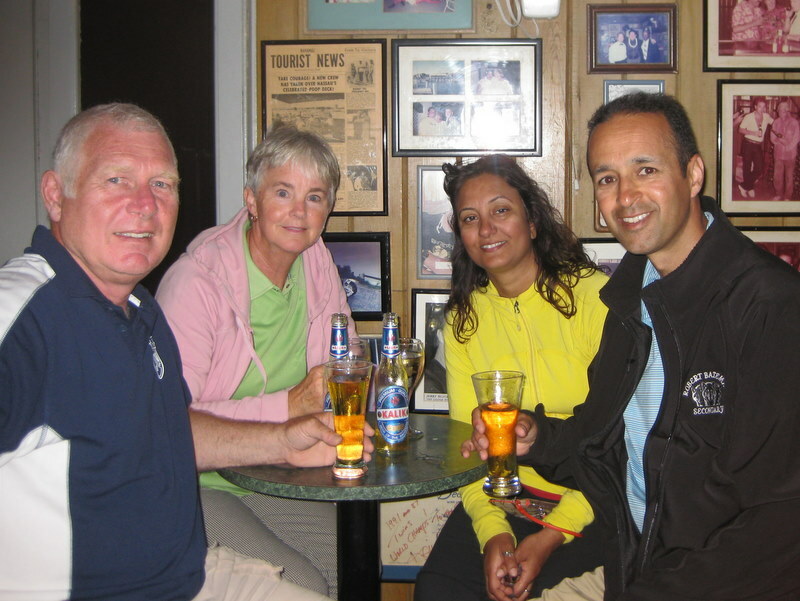 So Gavin, Kal, Jinder, Pam and Glen went exploring Tuesday evening and enjoyed Wednesday at the attractions and pools. 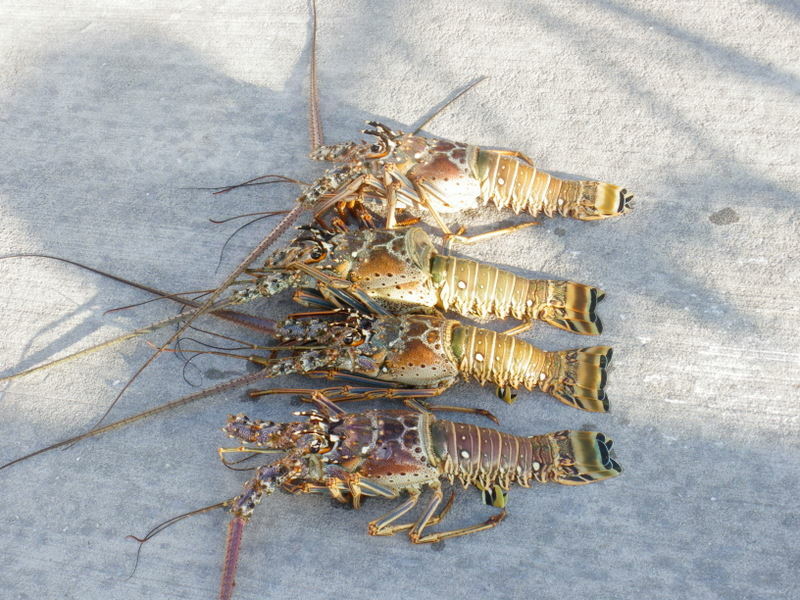 Just as we were deciding what to do for dinner on Wednesday a local fisherman showed up with lobster. Unfortunately for Jinder and Kal, Gavin has learned that he loves lobster! Uh oh... Gavin loves lobster. We had a visit with Shaun, Tom, Nicholas and Natalie Windt who were staying there after a Caribbean cruise and met up with Anita again before her return to Abbotsford. 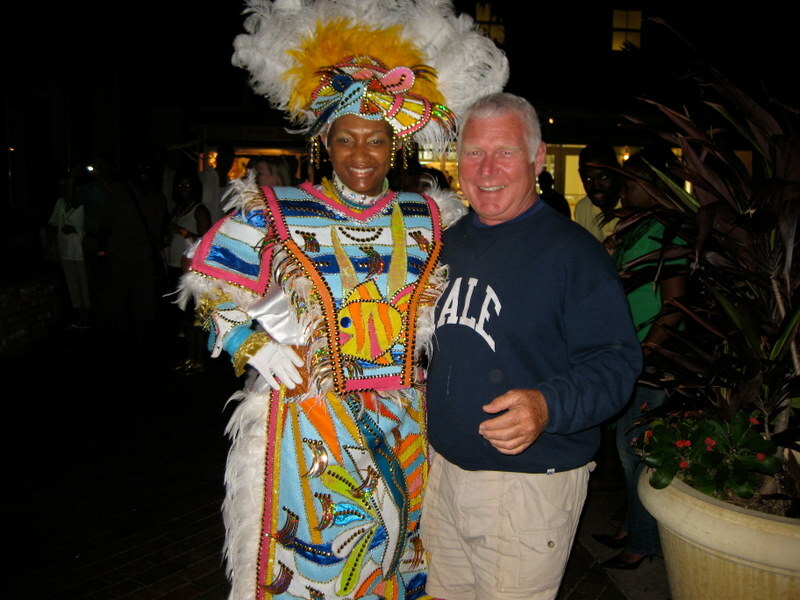 One evening we ended up in the middle of a Junkanoo parade! 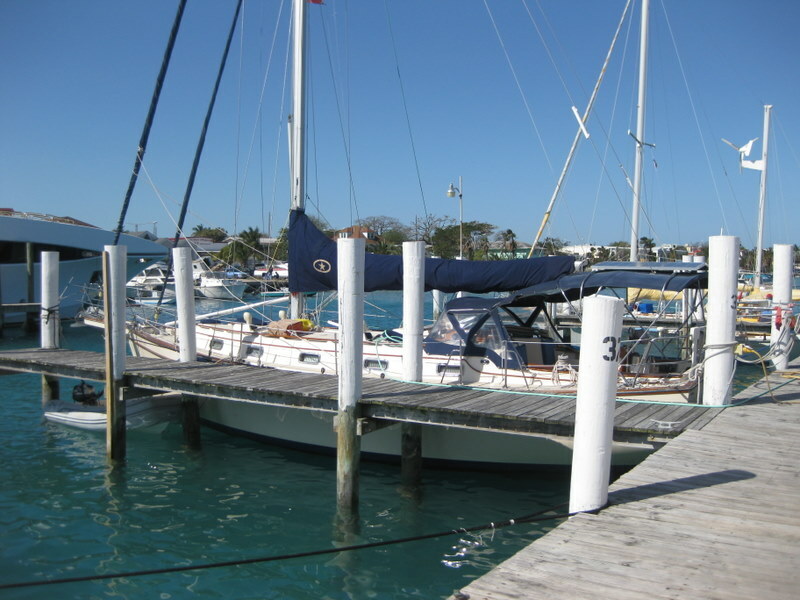 Thursday found us back in reality at the more mundane but functional Nassau Yacht Haven. 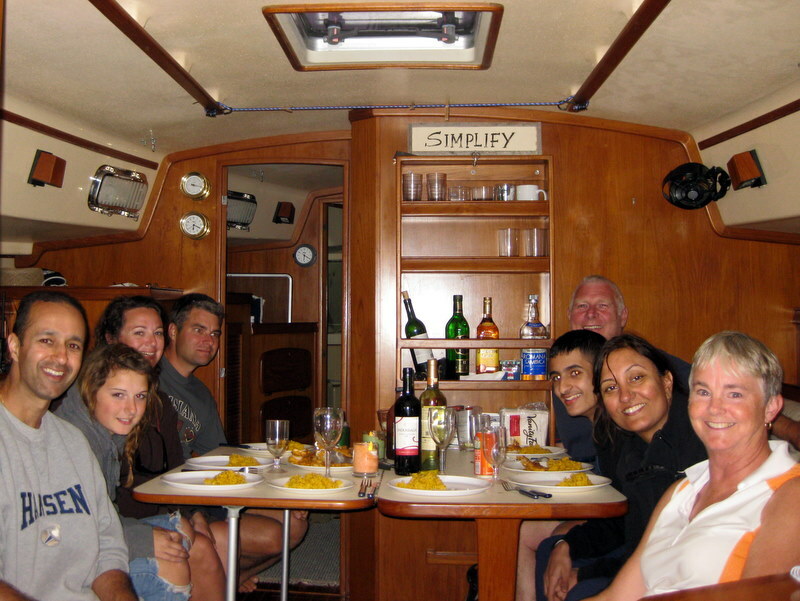 The Sarowas treated us to dinner at the Poop Deck and then we settled in for our last night. The Sarowas left us for the airport at 7 am and we spent the day puttering at the marina. It is strangely quiet when guests leave. Pam decided on an omelette for dinner – is this our parting routine? The marina was quite full when we arrived and they put us in a slip that would have worked if we didn’t have a bowsprit or a dingy hanging on davits. We spent the first night with a flashing light hung from our bow, hoping we wouldn’t be hit by a Bahamas Divers boat or one of the local fishing charters passing by. The next day Glen moved the boat to the next dock, removed the dingy and here we sit with our davits hanging out over the dock. Leaving on Tuesday might prove to be another adventure! Glen started our income tax, we did laundry and grocery shopping. 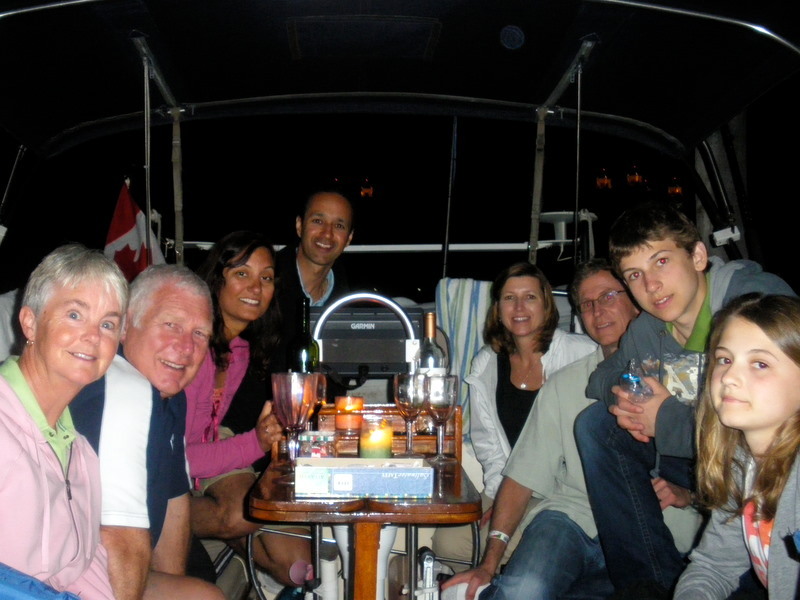 We had drinks with neighbours, Barb and Daryl from SeaWind II and shared docking nightmare stories. One evening we witnessed the effects of the current and tide on a big sailboat as he docked nearby bouncing off the wharf and bumping a boat. We are learning that most boaters struggle with docking. 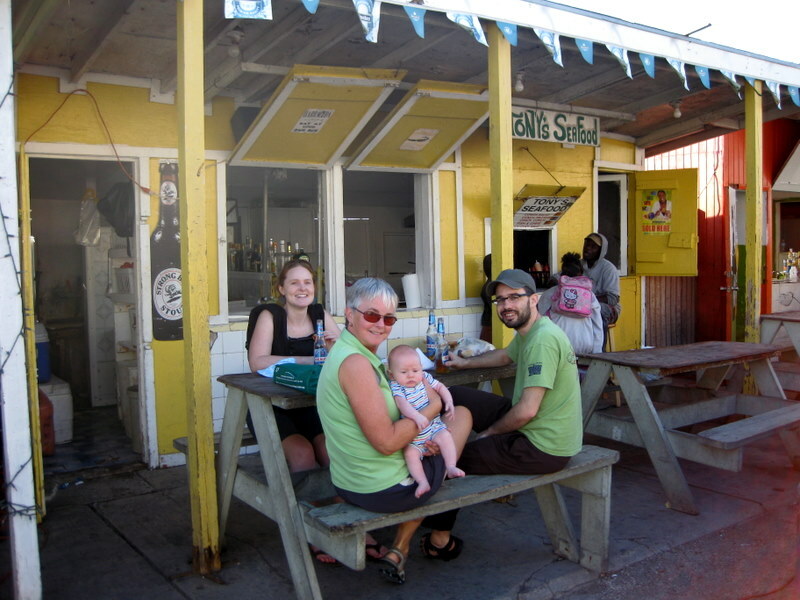 So, another adventure has ended and we are looking forward to the next… Jen, Luke and Jackson join us on Monday to explore the Exumas from Nassau to Georgetown. 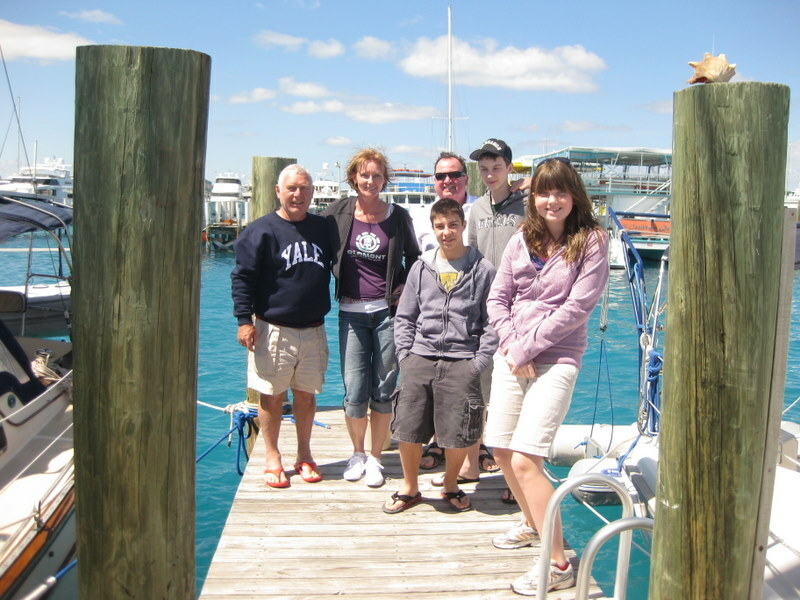 During our time at the Nassau Yacht Haven we connected with Anita McMahon and family. Their friends from Paradise Island brought them over to visit in their boat. We gave them a tour of Blue Pearl and said good-bye – maybe we will see them again next week if we return to Nassau before they leave for home. 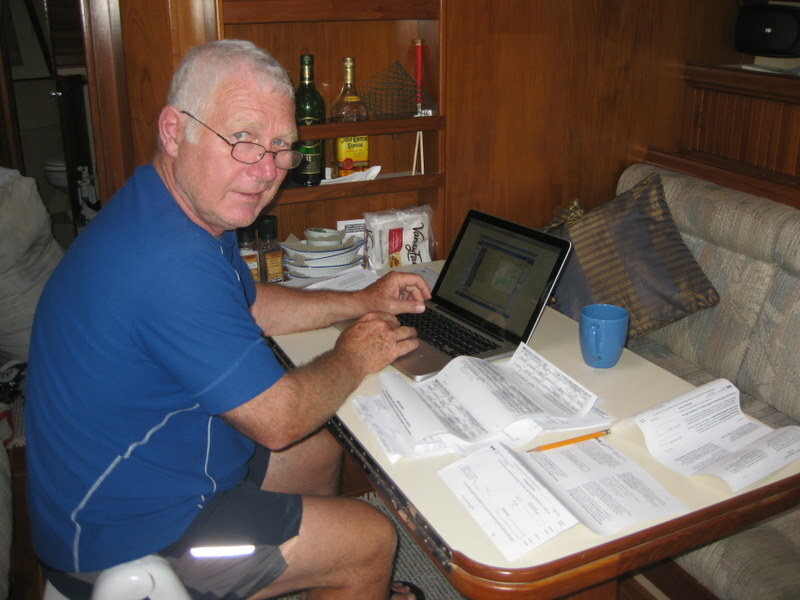 When we had arrived in Nassau this time, Glen noticed that one of the motor mounts was broken. Not a good thing. Went to Albert’s Marine Service to get a mechanic to install the spare that we had. The mechanic found that two more were broken. Only four mounts hold the motor on and three had been broken. Really not a good thing. Extras were ordered from Florida and we were impressed with the service. They arrived the next day and Jason from Albert’s Marine Service had them installed that afternoon. Back the next morning for final touch-ups and a sea trial and we were set. Turns out that Jason knows Jerome Cartwright, the headmaster from Matthewtown, Inagua in 1978. That afternoon Jason connected Glen with Cartwright and they had an interesting reunion. We will meet up with him when we return to Nassau next week. Small world. Actually the Bahamas is a small country. The Sarowas spent three nights at a fancy Cable Beach Hotel before moving onto Blue Pearl with us. We bought fritters and fish at Potters Cay, provisioned at the supermarket and the liquor store near the marina and took off. As usual, Captain Chaos provided entertainment to everyone as we left the dock. The strong current and wind, combined with the Captain’s uncanny knack for banging into things made for a spectacular departure. 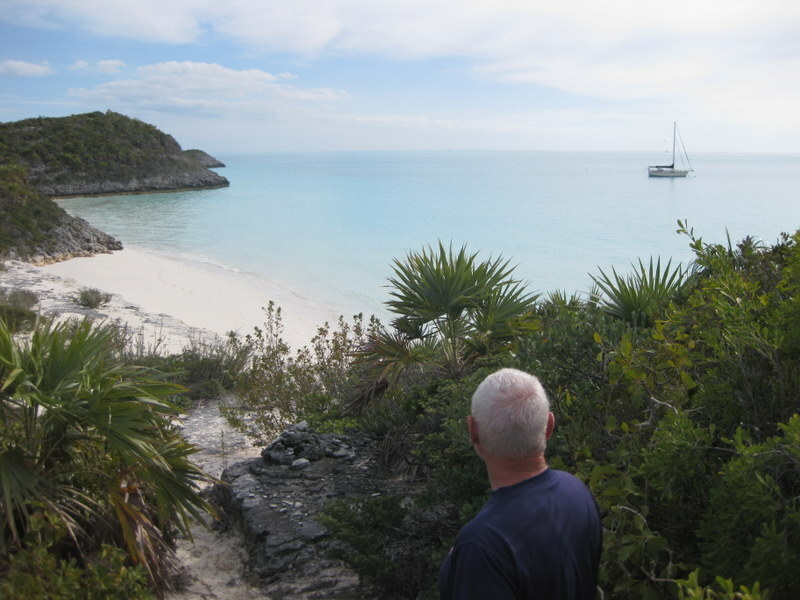 We arrived at Allan’s Cay without further mishap and found a good place for the hook. Alex and Kris from Blue Wind had followed us from Nassau through the Yellow Banks. They anchored nearby. 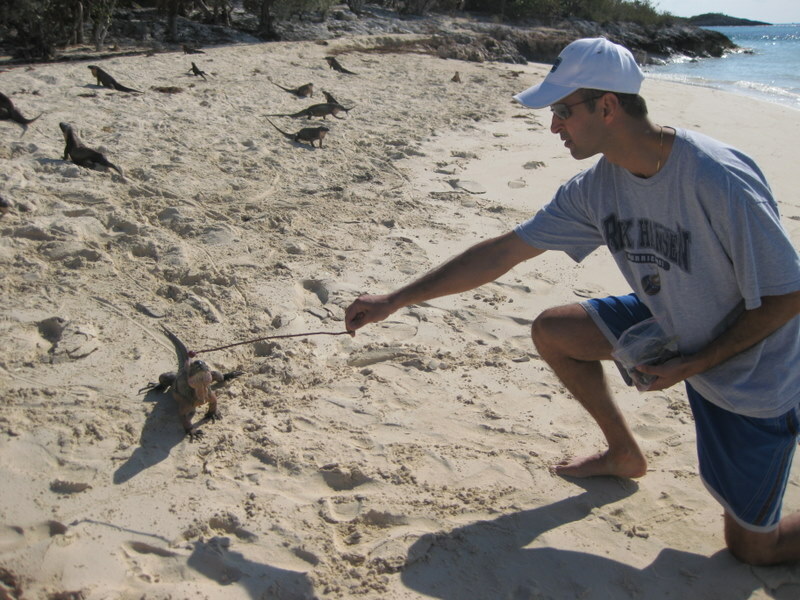 Once ashore we amused ourselves looking at all the iguanas. There had been some bad weather so there had been no tour boats feeding them for a couple of days and they greeted all the boats enthusiastically. Remembering our lesson from Pat on Kolibrie, we had brought grapes to feed them from a stick – too bad we hadn’t learned that trick before Mike learned from experience that, even without teeth, they can draw blood! The wind wasn’t warm so we weren’t too interested in swimming but Jinder did take a quick dip off a sand bar. On the beach we chatted with an Oregon family on the catamaran, Texas Two Step, Dave, Leslie and Michelle. They had sold their house and were fulltime cruisers. Michelle, a grade ten student, is doing her schoolwork by correspondence. They dingied by the boat so we invited them onboard for a drink. They were planning to make their own beer on the beach the next day – they had all the supplies and equipment onboard. While talking about food, Dave mentioned that he didn’t care for conch. Pam decided she would introduce him to her cracked conch and invited them for dinner. Glen used the new conch mallet to tenderize the tough meat and then coated it in Zantarain’s Fish Fry then lightly fried in olive oil. Paired with Spanish Yellow Rice and Kal’s Special Salad, dinner was ready. Eight of us crowded around our table and enjoyed drinks, good food, laughs and friendship. And Dave liked the conch. We had a lousy night banging back and forth in the waves and current and bolted out of there early in the morning. 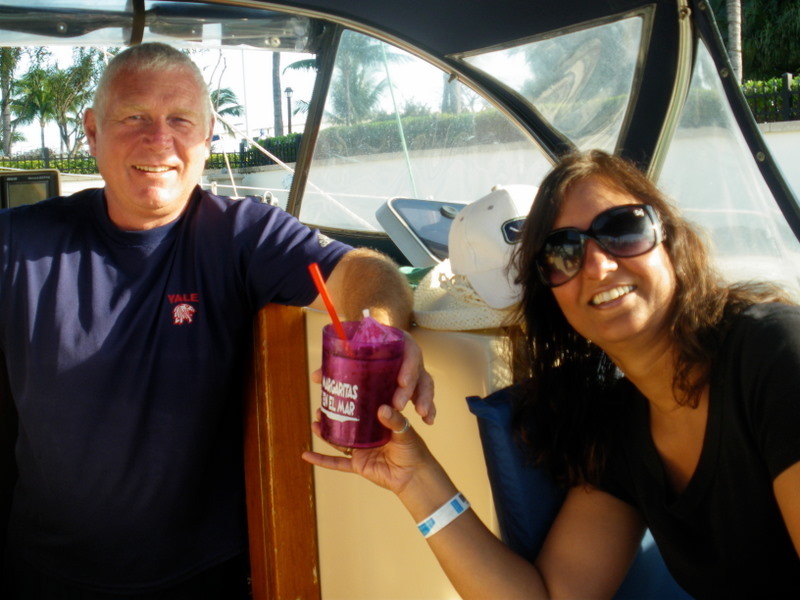 As we were raising the anchor, Dave and Leslie dingied over with a gift for us…. a cutting board to use the next time we made cracked conch! Thank you, Texas Two Step. 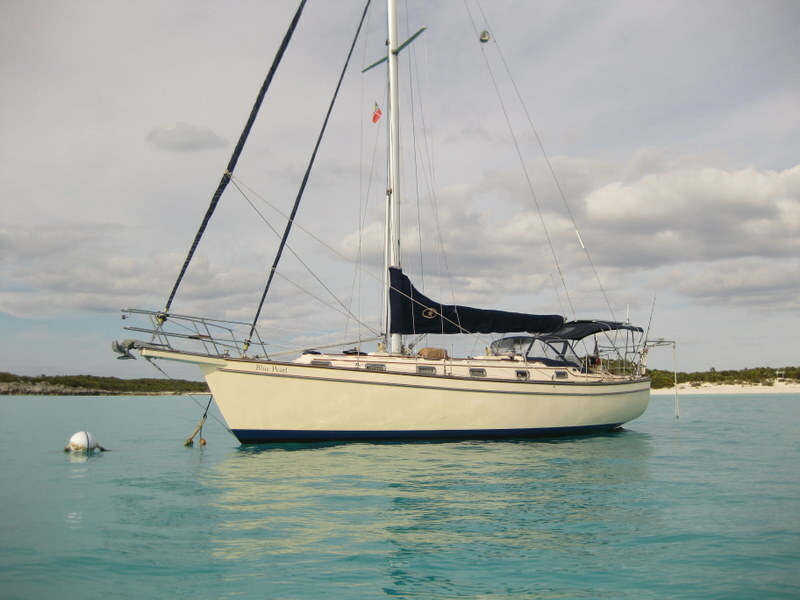 We had big (6 to 8 foot) seas so the first part of the ride was uncomfortable but we decided to hole up at Norman’s Cay – only a little way away – where we could anchor with more protection and get some sleep. At Norman’s we all had a sleep, showered and then, feeling revived, we dingied ashore and walked over to McDuffs so Jinder could buy us all expensive drinks. Jambalaya dinner, Bananagrams and Balderdash then to bed. We thankfully had a very calm night on the anchor but woke up to discover we were out of water. We couldn’t quite believe that we had used 157 gallons in two days. Glen did all of the checks he knew and could not discover where the water had gone. Luckily, Pam had a five gallon jerry can of water saved so we decided to enjoy the day and just not wash. A day of exploring islands, reading and relaxing. Just no washing. Our second morning at Norman’s looked beautiful and we extended our “no wash” rule and spent another day in this beautiful anchorage. The five gallons were stretching further and further as none of us really wanted to leave. 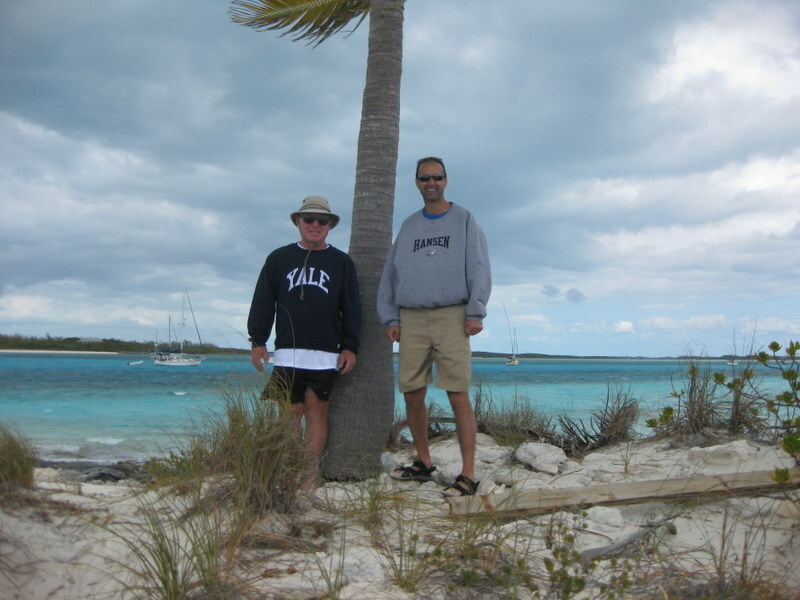 Dingy trips to Wax Cay and Norman’s Pond kept us busy as well as Margaritas and G&T’s. Jinder and Kal treated us to Eggs with Indian spices and a Chick Pea curry, using spices they had brought from home. Glen made his famous Boiled Fish dinner. Beautiful sunsets, blue water, swimming from a deserted beach – priceless. We are now off to Nassau and will spend the night at the Atlantis Resort. Not washing can only last so long and we have decided to treat ourselves to this lavish resort for a night or two. After Mike and Charlotte left us at Staniel Cay, we had a strange afternoon. We hadn’t slept well the night before as the approaching front had us rocking and rolling with the wind causing the boat to pitch around and the halyards to slap against the mast. It was deafening! So we were tired as we tried to adjust to being alone again on the boat. We waved to two planes as they went overhead – one must have carried the Inmans and we wondered if they had seen us standing on the deck waving. We moped around trying to get back into our old rhythm. Pam gave Glen a much needed haircut in the cockpit. One untrained barber plus one rolling boat equals one poor haircut. Luckily hair grows. An omelette dinner, a few games of crib and then to bed. We woke to a calm morning and headed north towards Hawksbill Cay. 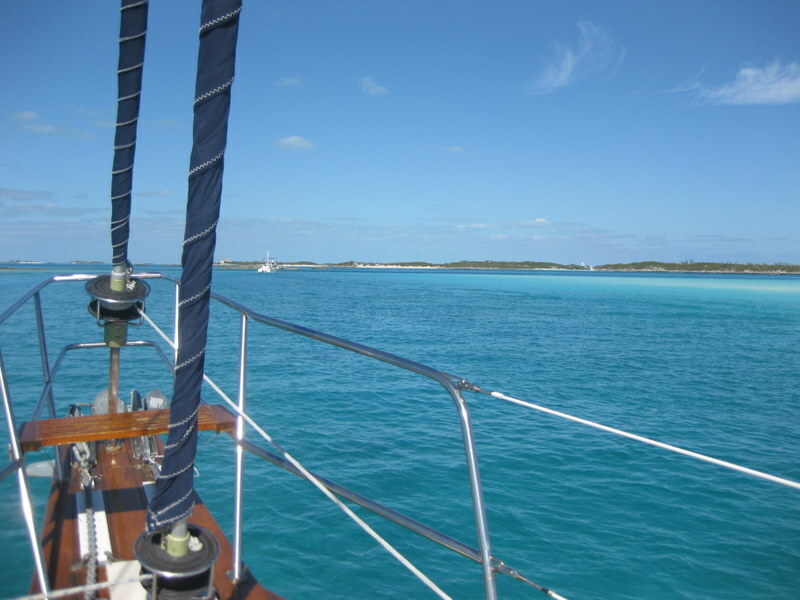 It is in the Exuma Land and Sea Park so we tied to one of their mooring balls. We could have anchored but we like to support their conservation efforts. A mooring ball is $15 for the night. For about six hours we were the only boat next to a beautiful beach and island. We are still amazed at the colour of this water. Look at the colour of the water! As the sun was setting, two other boats came to join us. Glen won two games of Bananagrams before we put on our mast light and went to sleep. Another front was approaching so we knew we needed a secure anchorage for the night. 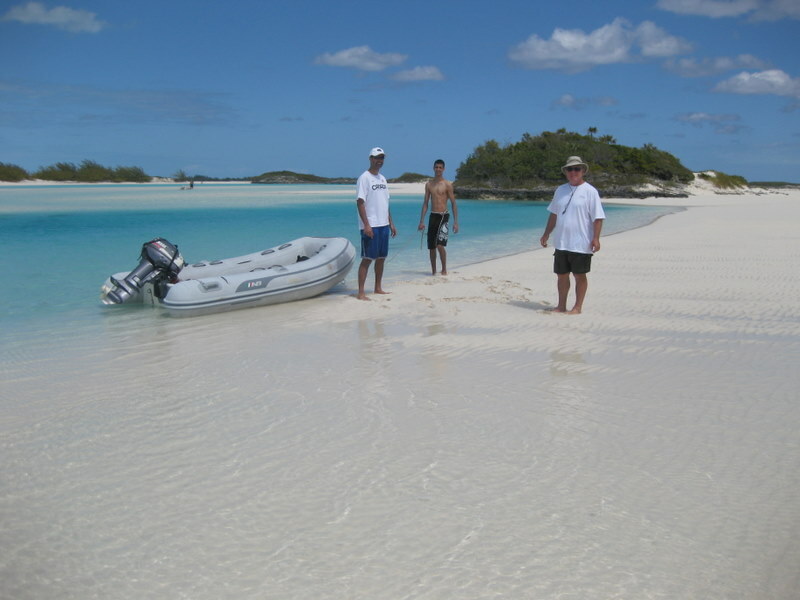 We had planned to return to Norman’s Cay but arrived there at 10 am so continued north to look at Highborne Cay. We motored around that anchorage at noon and agreed that it did not give us the protection we wanted. So, we spent the night back at Allan’s Cay. Our great Delta anchor held us snuggly while we were hit by 30-35 knot winds with gusts to 50 knots. The current swung us in circles as the wind clocked from the south to the northwest during the night. It was a crazy night. We slept in the main salon so we could hear the different sounds and be able to react if needed. A clear sky and a big full moon allowed us to keep tabs on the three other boats in the anchorage and to check that our anchor held tight. We snoozed ‘til late in the morning as the wind whistled around us and lessened to 20 knots. Mike and Charlotte had restocked our fruit and veggies and loaded us up with wonderful bread from the Bread Lady and we are eating well! We are listening to reports of the Olympic hockey gold medal game on the satellite radio. We just heard that Sidney Crosby scored the winning goal in overtime. Yay Canada! Tomorrow we will head into Nassau. We had such a great visit with Mike and Charlotte and we are looking forward to all of the visitors coming in March. Jinder and Kal arrive in Nassau tomorrow and will come aboard on Thursday. Jen, Luke and Jackson arrive later in the month and we are hoping Don and Pat can work in a trip as well. So March will be another great month! Another reason to look forward to March is that we heard the fronts come less often as spring approaches. Plus, on March 1 we can restart our monthly crib game tally. For February, Glen is winning 14 games to 8!